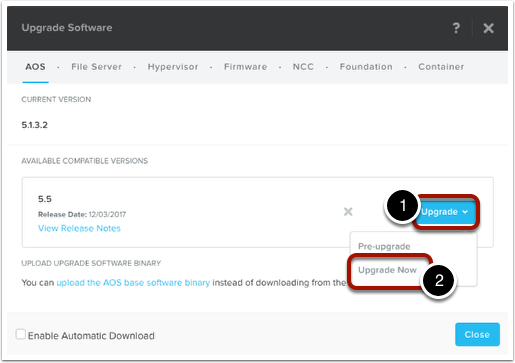 This lesson will show you how to upgrade Nutanix AOS when the 1-click download option isn’t available. This might be due to not having internet access to the Nutanix cluster (e.g. dark site), or there is a new AOS version available but Nutanix hasn’t published the latest release to the 1-click download option yet (which is typically 3-4 weeks after general availability (GA) on the portal). To access the 1-click upgrade option with Prism, select the "gear icon" (1) then choose "Upgrade Software" (2). 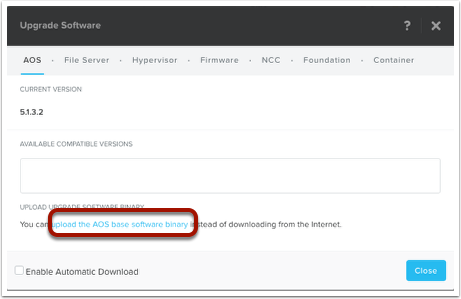 If you do not see any downloads available on this screen, you can still use the blue link that says "Upload the AOS base software binary" to upload the software to the cluster. Once prompted, click on the "Choose File" links to browse your computer for the Metadata file (json format), and for the binary file (tar.gz format). Then choose the "Upload Now" option. This will upload the files you have downloaded to the cluster. 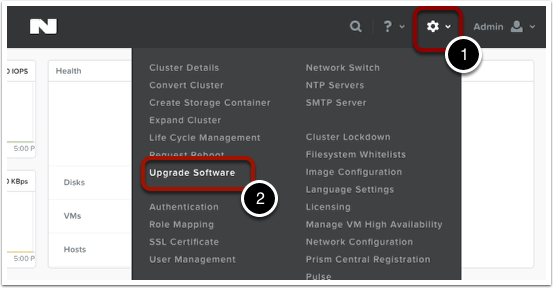 Once the files have been uploaded to the cluster, choose the "Upgrade" option (1), then choose "Upgrade Now" (2). 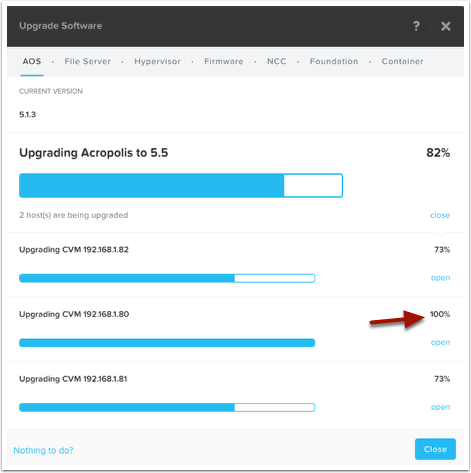 The "Upgrade Now" option will also perform the Pre-Upgrade steps, which verifies that the cluster satisfies the requirements for the upgrade. 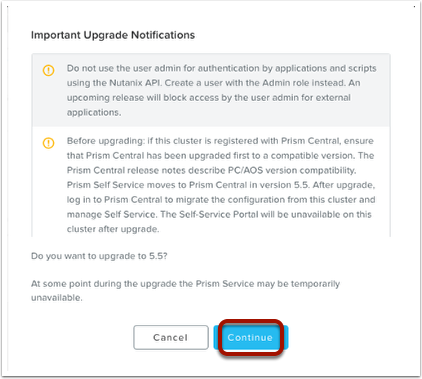 In some releases, you will get the "Upgrade Notifications" screen which has some helpful guidelines for upgrading to the release you chose. Please review these notifications and make any changes that are necessary. Once completed, choose "Continue" to proceed. 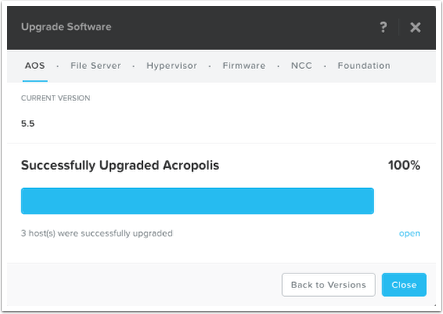 The upgrade will then go through various pre-upgrade steps, which does several checks, including verification that the cluster meets the minimum requirements for the new software version. After the Pre-Upgrade Steps are completed, the AOS upgrade will continue. 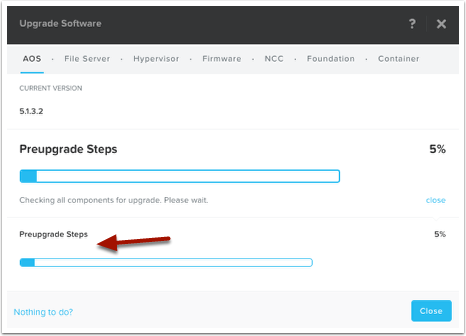 You will see that the software upgrade for all of the Controller Virtual Machines (CVM’s) in the cluster will progress in parallel, up to the point of needing a reboot. Then each CVM will reboot one at a time so that cluster health is maintained. Also of note, is that all of the user virtual machines on the host that has the CVM rebooting do not need to vMotion or live migrate to another host. The user virtual machines can stay on that host and data I/O will just be redirected to other CVM’s in the cluster. You might also lose access to Prism during this step, normally when the CVM that you are connected to via the cluster virtual IP (VIP) gets rebooted. Just refresh/reload your browser and the VIP will redirect to a different CVM that is currently up. 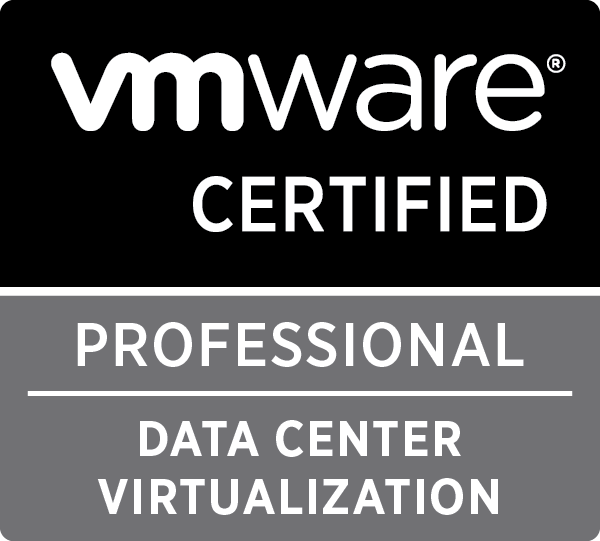 This entry was posted in Manuals & How-To's, Nutanix on December 11, 2017 by virtualdennis.